Some of the scarves I’ve knitted through out the years. Every time I sit down to knit, I think of Mrs. Sachs. She wore black rhinestone-studded cat-eye glasses, false eyelashes, heavy make-up, black eyeliner, and bright red lipstick. Her hair was teased or was she wearing a wig? She was my third grade teacher. Mrs. Sachs taught me to knit. She taught me and two other classmates on Wednesdays after school how to select needle size and yarn. With her long fake nails, she demonstrated how to hold our knitting needles, cast stitches, and knit the garter stitch. I quickly learned how to cast stitches and knit a very irregular garter stitch. I knitted a somewhat crooked green half hat. After “mastering” the garter stitch, I knitted a scarf of alternating uneven emerald green and navy blue squares with holes through out from dropped stitches. I proudly wore that scarf for years. With each stitch I learned the importance of patience, practice, and the beauty of imperfection. Fifty years later, I am still knitting scarves. I began knitting again about fifteen years ago. I don’t remember why I started knitting again but I suspect it had to do with expensive retail scarves whose stitch I recognized. Why pay for scarves, when you can knit them! Through out the years, I have knitted a very wide scarf that resembles a mini afghan in my daughter’s school colors — grey and navy blue (I got a little carried away with the stitch count). I knitted a pretty decent scarf in my son’s school colors — maroon and gold. It looks like Harry Potter’s scarf. 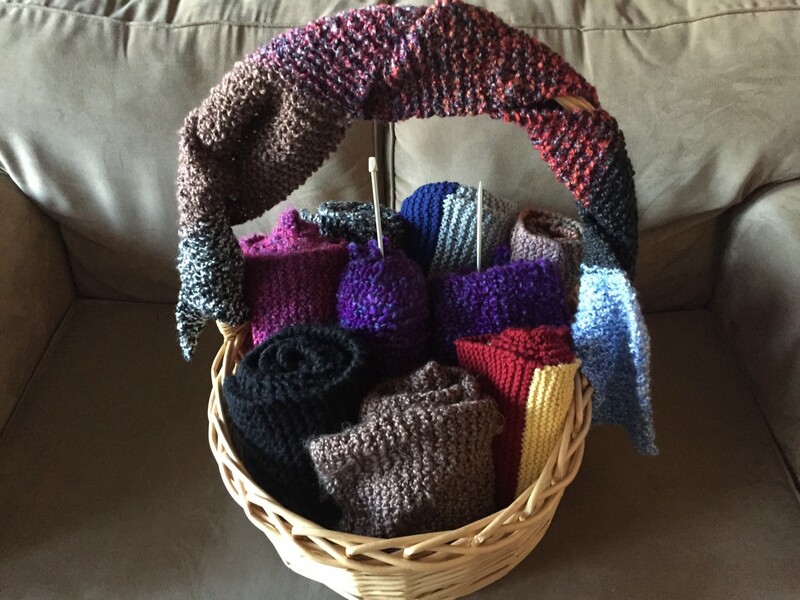 I have also knitted scarves for my parents, my husband, and myself. My scarves receive lots of compliments from family, friends, and perfect strangers. Last summer I knitted a pastel pink and pastel green scarf for my baby granddaughter in time for autumn. I recently knitted her another scarf made from remnant yarn I’ve kept through out the years so she can stay warm on cold winter days and sport it as she makes snow angels. Now I’m knitting a soft and comfy purple haze scarf for a special person. And I have a request from my 25-year old son — he wants a black knitted hat. It will be a birthday gift. The great thing about knitting is that you can knit just about anywhere and anytime. I have knitted during my children’s basketball, baseball, and field hockey games, and karate lessons — not because I don’t enjoy their sports but because I can knit with one eye on the needle and one eye on the field, court, or mat. I always squeezed in a row or two between time outs. I knit on long car rides to my next ultramarathon event while my husband drives. Recently, I took my knitting bag to my doctor’s appointment. Not one to sit idle in the waiting room, I added a few more rows to the scarf I’m making for my special person. I knit while listening to soft and calming music at home. I knit while listening to but not watching mindless reality TV or the depressing news channels. By the end of TV watching, I’ve knitted many rows and feel very accomplished. Today learning to knit is easier than ever. There are hundreds of knitting videos on YouTube and instructional aids on the web. Just google how to knit. They teach and demonstrate how to cast on stitches, make a slipknot on the knitting needle; how to knit the garter stitch, the purl stitch, and much more. Your fingers will feel awkward. You will make mistakes. You might get frustrated. But that is OK! Anyone can knit! Mrs. Sachs thought so when she inspired a group of third graders, and so do I. Now it’s time for me to graduate from knitting scarves to knitting sweaters for my granddaughter and grandson. Knitting is a calming art and hobby, and a lifelong gift. Any thing that is knitted with patience, care, and love is beautiful with all its imperfections. From all my years of knitting, I have learned that knitting is very relaxing, meditative, and peaceful. Knitting gives me much joy. Knitting is a stress-buster. So untangle yourself from the stressors in your life and tangle your self in the calming effects of knitting.